First published in The Atlantic Monthly in February 1862 by American writer Julia Ward Howe, the song quickly gained popularity due to its connection to the American Civil War. After all these years, “The Battle Hymn of the Republic” is still one of the most beloved patriotic songs of all time. It’s been heard at national conventions for both major political parties, and has been recorded and performed by some great artists. One such artist was Johnny Cash, who sang the song along with The Tennessee Three, The Carter Family, and The Statler Brothers. They performed the song as the finale for the September 27, 1969 episode of Cash’s variety show, The Johnny Cash Show. Cash started off standing alone on stage, with nothing but darkness behind him. He briefly introduced the song, and spoke of how important it was to troops during the Civil War. After Cash introduced the song, he slowly started singing it while strumming along on his guitar. Since he had no one else singing with him at the time, Cash’s raw emotions and passion for the song were on full display. That’s what makes this performance so remarkable, is the fact that you can tell Cash meant every word he sang. Eventually the other groups joined in as well, providing stunning harmonies to Cash’s lead vocals. At one point Cash even stopped to speak the words, and began marching along on stage. None of this was about putting on a show for Cash, rather, he was simply feeling the words of the music. Cash was known for his outstanding performances, and we feel like this one is right at the top of the pack. See for yourself in the video below. 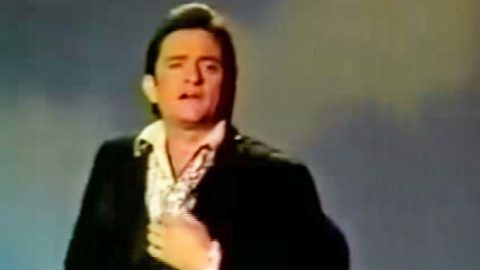 If you thought you loved Cash before, you’ll fall in love with him all over again when you hear his stunning version of this American classic.